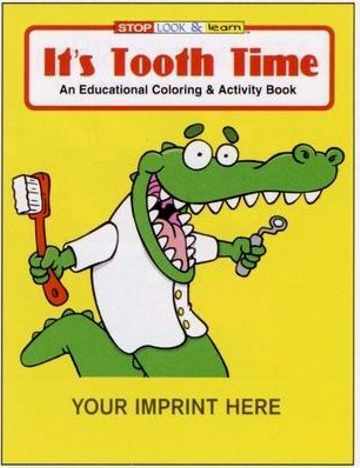 "It's Tooth Time" is a fun filled, 16 page educational coloring and activity book, that is sure to keep patients smiling. "A Trip To The Dentist" is a fun filled, 16 page educational coloring and activity book. 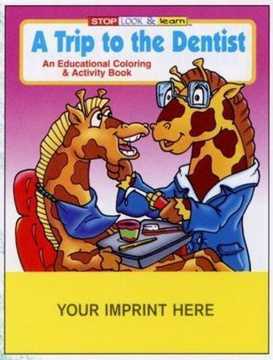 This wonderfully illustrated book helps children understand how important it is to visit the dentist regularly. It also helps lessen anxiety about a trip to the dentist. 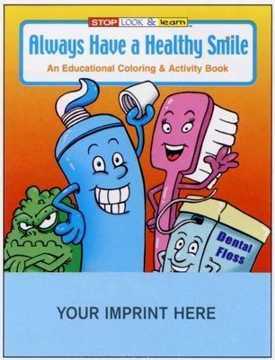 "Always Have A Healthy Smile" is a fun filled, 16 page educational coloring and activity book. This book helps make it fun for children to maintain a healthy smile. Unit prices below include your custom imprint in Black ink. Free artwork design. Shrink Wrap is Available: ask us. Setup Charge: $35.00; no Setup Charge on repeat orders. Imprint Area: 7.0" x 1.75" in Black only. Normal Production Time: 10 days. Contact us for faster delivery.